WSX-1 is a member of the class I cytokine receptor family with homology to IL-12Rβ2 and is essential for the initial mounting of Th1 responses. STAT1 interacts with tyrosine-phosphorylated WSX-1, and the conserved tyrosine residue of the cytoplasmic domain of WSX-1 is essential for transcriptional activation of STAT1. IL-27 stimulation induced STAT1 phosphorylation in wild-type but not in WSX-1-deficient naive CD4+ T cells. Although IL-27 did not directly induce IFN-γ production by wild-type CD4+ T cells, IL-12-dependent IFN-γ production was augmented by IL-27 stimulation in wild-type naive CD4+ T cells but was impaired in WSX-1-deficient naive CD4+ T cells. Additionally, IL-27 stimulation induced T-bet and IL-12Rβ2 expression in wild-type, but not in WSX-1-deficient, CD4+ T cells. Thus, during the initiation of Th1 differentiation, the IL-27/WSX-1 signaling system plays a pivotal role by STAT1-mediated T-bet induction before the IL-12R system. The regulation of the differentiation of naive CD4+ T cells into either Th1 or Th2 cells is a critical process when naive CD4+ T cells encounter Ag. Th1 and Th2 cells develop from the same Th precursor cells, and cytokines play roles for the regulation of differentiation. IL-12 promotes IFN-γ production and the differentiation of naive CD4+ T cells into Th1 cells via STAT4 (1). IL-12Rβ2 chain expression is rapidly up-regulated by signals, including TCR stimulation, and is required for STAT4 activation. T-bet, a key transcriptional factor for Th1 initiation, is exclusively expressed in Th1 cells and is a potent transactivator of the IFN-γ gene (2). Although the role of T-bet for Th1 induction is clear, the induction mechanism for T-bet has been controversial (2, 3, 4, 5). WSX-1 is a novel class I cytokine receptor with homology to the IL-12Rs and is highly expressed in lymphoid tissues (6, 7). WSX-1 encodes a putative cytokine receptor with a WSX signature motif in its extracellular domain and a box 1 motif in its intracellular domain. There is one conserved tyrosine residue between human and murine WSX-1, suggesting that WSX-1 is capable of signal transduction by tyrosine phosphorylation. Analyses of WSX-1-deficient mice revealed that WSX-1 is required for normal production of IFN-γ by naive CD4+ T cells, indicating that WSX-1 signaling is essential for the initial mounting of Th1 (8). Reportedly, IL-27 is a candidate ligand for WSX-1 (9). However, the downstream signaling pathway of IL-27/WSX-1 system has not been elucidated. In the present study, we demonstrated that STAT1 is activated through interaction with the tyrosine residue in the cytoplasmic domain of WSX-1. In addition, we found that IL-27-dependent tyrosine phosphorylation of STAT1 and IL-12-dependent IFN-γ production were abrogated in WSX-1-deficient naive CD4+ T cells. Furthermore, IL-27 induced expression of T-bet through WSX-1 signaling in wild-type naive CD4+ T cells. In toto, these results showed that IL-27/WSX-1 signaling is important for the initial commitment of Th1 responses. HEK293 cells were cultured in DMEM containing 10% calf serum. Ba/F3 was maintained in RPMI 1640 medium containing 10% FCS and 1 ng/ml murine IL-3. Stable WSX-1-expressing Ba/F3 transformants were obtained by transfection of the Ba/F3 cells with pCMV14 (Sigma-Aldrich, St. Louis, MO) carrying 3xFlag-tagged full-length WSX-1 cDNA. Stable Ba/F3 transformants expressing both WSX-1 and STAT4 were obtained similarly. Murine rIL-12 and anti-IFN-γ neutralizing Ab were purchased from R&D Systems (Minneapolis, MN). Anti-STAT1 and anti-phosphotyrosine (PY)3-STAT1 Abs were purchased from New England Biolabs (Beverly, MA); anti-STAT3, -4, and -5b Abs were from Santa Cruz Biotechnology (Santa Cruz, CA); anti-mouse IgG-HRP and anti-rabbit IgG-HRP Abs were from Jackson ImmunoResearch (West Grove, PA); and anti-FLAG M2 was from Sigma-Aldrich. Anti-T-bet Abs were kindly provided by Dr. L. Glimcher (Harvard School of Public Health, Boston, MA). For expression of the IL-12Rβ2/WSX-1 chimeric receptor (β2/W), a cDNA encoding the extracellular domain and a portion of the cytoplasmic domain containing the box 1 region of IL-12Rβ2 was fused to cDNA fragments encoding the cytoplasmic domain of WSX-1 containing the conserved tyrosine residue. The chimeric cDNA was subcloned into pCMV14–3xFLAG. One substitution mutant of β2/W, β2/W-mt (mutation at the conserved tyrosine residue of mouse WSX-1 into phenylalanine), was derived from β2/W. For immunoprecipitation, cells were lysed in a lysis buffer containing protease inhibitors and vanadate and immunoprecipitated with the indicated Abs. Precipitated immunocomplexes or total cell lysates were resolved by SDS-PAGE and immunoblotted with indicated Abs. GST fusion protein containing the cytoplasmic domain of WSX-1 was expressed in Escherichia coli strains BL21 or TKB1, and purified with glutathione-Sepharose beads. Cell lysates from splenocytes of wild-type mice were added to the fusion proteins bound to Sepharose beads. Bound proteins were examined by electrophoresis and immunoblotting with indicated Abs. IL-12-dependent STAT1 reporter activity was assayed as described previously (10). HEK293 cells were plated at 2 × 105/well on 6-well dishes. Cells were transfected with indicated combination of the genes by the calcium phosphate method. After stimulation with IL-12, luciferase activity was measured using the Promega luciferase assay system (Promega, Madison, WI) according to the manufacturer’s directions. Luciferase activity was normalized to β-galactosidase activity. CD4+ T cells were purified from wild-type, WSX-1-deficient, or IFN-γ-deficient mice by MACS. Cells were activated with plate-bound anti-CD3ε Ab (145-2C11; 10 μg/ml; BD PharMingen, San Diego, CA) for 24 h, washed, and stimulated with IL-27 in the presence of anti-IFN-γ neutralizing Abs (1 μg/ml). Cell lysates were prepared, electrophoresed, blotted, and then visualized with anti-PY-STAT1 Ab. Sorted naive CD4+ T cells were stimulated with plate-bound anti-CD3ε mAb (1 μg/ml) plus anti-CD28 mAb (1 μg/ml) and anti-IFN-γ neutralizing Ab in the absence or presence of IL-27. RNA was prepared with TRIzol (Life Technologies, Rockville, MD). For semiquantitative RT-PCR, cDNA was reverse transcribed from total RNA with oligo(dT)16 primers and murine leukemia virus reverse transcriptase (PerkinElmer, Wellesley, MA). First, the amounts of cDNA were adjusted by quantitating the amount of G3PDH PCR product using the ABI Prism 7000 sequence detection system (ABI, Foster City, CA). Then, the same amounts of cDNA normalized to the G3PDH were amplified for IL-12Rβ2. The following primers were used: IL-12Rβ2, sense, 5′-ACT GTC AGA GAG CCA AGG AG-3′, and antisense, 5′-GTG CCC ACC GTG ATG ATA G-3′. Cytokine receptors constitutively interact with JAK that phosphorylates the receptors on tyrosine residues in the intracellular domain (11). To investigate whether WSX-1 interacts with JAK, murine WSX-1-expressing Ba/F3 lines (Ba/F3-WSX-1) were established. We found that JAK1, but not other JAKs, was coprecipitated with WSX-1 (Fig. 1⇓A). Similarly, WSX-1 is precipitated with anti-JAK1 Ab, but not with control anti-Myc Ab in WSX-1-expressing cells. Cytoplasmic domains of cytokine receptors, when phosphorylated by JAKs, bind STATs (11). Among tyrosine residues present in the cytoplasmic domain of mouse WSX-1, only Y609 is conserved between human and murine (6, 7). To investigate whether STATs bind to Y609 of WSX-1, an in vitro pull-down assay was conducted. WSX-1 protein was expressed as a GST fusion protein in E. coli strains BL21 or the tyrosine kinase-positive derivative TKB1. GST-fused cytoplasmic domain of WSX-1, which was phosphorylated when expressed in TKB1 (data not shown), was able to associate with STAT1 but not other STATs examined, including STAT3, -4, and -5b (Fig. 1⇓B). Unphosphorylated form of GST-WSX-1 produced in BL21 did not associate with any STATs. Association of WSX-1 with STAT1 was further confirmed using WSX-1-expressing Ba/F3 cell lines, Ba/F3-WSX-1. As shown in Fig. 1⇓C, in cell lysates of Ba/F3-WSX-1 treated with pervanadate for increase of tyrosine phosphorylation, only STAT1 was revealed to interact with WSX-1. No association of STAT4 with WSX-1 was detected in Ba/F3-WSX-1 overexpressing STAT4 (Fig. 1⇓C). These results indicate that only STAT1, but not other STATs including STAT4, can be recruited to WSX-1 in a phosphorylation-dependent fashion. Association of STAT1 with tyrosine-phosphorylated WSX-1. A, Lysates of Ba/F3-WSX-1 cell lines were incubated with anti-FLAG M2 Ab for precipitation of FLAG-tagged WSX-1 or with a control Ab. Precipitates or total cell lysates (TCL) were electrophoresed, blotted, and probed with indicated anti-JAK Abs. Reciprocal immunoprecipitation was conducted by treating cell lysates with anti-JAK1 Ab. Precipitates or total cell lysates were analyzed with anti-FLAG M2 Ab. B, Splenocyte lysates were incubated with GST-WSX-1 produced in either BL21 or TKB1 immobilized on glutathione-Sepharose beads. Bound proteins were electrophoresed, blotted, and visualized with anti-STAT1, -3, -4, or -5b Abs. The integrity and quality of the GST-fused WSX-1 protein were confirmed with anti-GST Ab (bottom panel). C, Ba/F3-WSX-1 cells were either untreated (−) or treated (+) with pervanadate. Immunoprecipitations were performed with anti-FLAG M2 Ab, and precipitates were examined for the coprecipitation of STAT1, -3, or -5b with indicated Ab. Ba/F3-WSX-1-STAT4 cells were treated likewise for the association of STAT4 with WSX-1 (bottom panel). Total cell lysates were examined for verification of the same expression level of each STAT after vanadate treatment. All experiments were repeated three times with similar results. 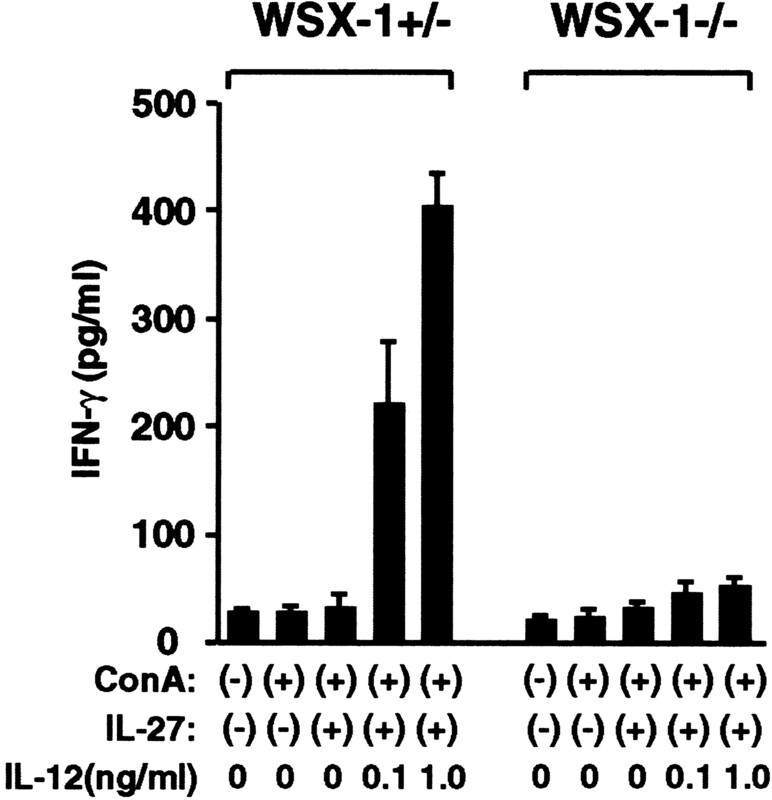 Recently, IL-27, an IL-12-related cytokine, has been reported as a candidate ligand for WSX-1 (9). However, neither Ba/F3-WSX-1 cells nor Ba/F3-WSX-1/STAT4 cells responded to IL-27 by either proliferation or protein tyrosine phosphorylation (data not shown), due presumably to lack of component(s) of the WSX-1 receptor complex and/or downstream signaling pathways in Ba/F3 cells. For circumvention, we constructed a chimeric receptor (β2/W) where the extracellular domain and box 1 is of IL-12Rβ2 and the cytoplasmic domain is of WSX-1. When coexpressed with IL-12Rβ1, exogenous IL-12 can ligate IL-12Rβ1 and β2/W and may reconstitute WSX-1 signaling, at least partly. Thus, ligand-induced transcriptional activation of the reporter gene by STAT1 was tested by cotransfecting the IL-12Rβ1, the β2/W chimeric receptor, and the IFN-γ activation site (GAS) luciferase reporter gene into cells. As shown in Fig. 2⇓A, IL-12 treatment increased the STAT1 transcriptional activity by 4.4-fold in cells transfected with IL-12Rβ1 and the β2/W chimeric receptor (β1 plus β2/W) while the same treatment increased GAS-luciferase activity by only 1.6-fold in IL-12Rβ1- plus -β2-expressing cells (β1 plus β2). We also constructed a substitution mutant form of β2/W Y824F (mutation at the conserved tyrosine residue of WSX-1 into phenylalanine). Then, we determined the transcriptional activation by STAT1 under the β2/W mutant receptor. GAS-luciferase activity in cells expressing β1 plus β2/W mutant Y824F (β1 plus β2/W-mt) was not augmented by IL-12 treatment over that observed in β1- plus β2-expressing cells (Fig. 2⇓A). STAT1 is reported to dock to the sequence pYDKPH in the IFNR (12, 13). The pYEKHF motif at the conserved tyrosine residue in WSX-1 shares amino acid similarities to the STAT1 docking site of the IFNR, pYDKPH. Thus, it is conceivable that STAT1 is activated by interaction with the WSX-1 at the conserved tyrosine residue upon ligand binding. STAT1 activation by WSX-1 signaling. A, HEK293 cells were transfected with a plasmid mixture containing the GAS luciferase reporter gene, IL-12Rβ1-expressing constructs (β1), and either wild-type (β2/W) or Y824F mutant (β2/W-mt) chimeric receptor, along with β-galactosidase gene or untreated (mock). After 24 h, indicated transfected cells were incubated with (▪) or without (□) IL-12 (100 ng/ml for maximum induction of GAS-luciferase activity) for 12 h, and cell extracts were prepared for luciferase activity. ∗, p < 0.01 by paired t test. Data normalized with the β-galactosidase activity from triplicate experiments are shown. Experiments were repeated three times with similar results. B, CD4+ T cells from spleens of either WSX-1+/− or WSX-1−/− mice were activated with plate-bound anti-CD3ε Ab (10 μg/ml) for 24 h. The activated cells were washed twice, and then incubated in the presence of IL-27 with anti-IFN-γ neutralizing Ab (1 μg/ml) for the indicated periods. Phosphorylation of STAT1 in whole cell lysate was analyzed with anti-PY-STAT1 Ab. IFN-γ−/− CD4+ T cells were treated similarly, and STAT1 phosphorylation was observed. Filters were stripped and reprobed with anti-STAT1 Ab as internal controls. To further examine the STAT1 activation downstream of WSX-1, we examined whether IL-27 could activate STAT1 through WSX-1. To address this, we took advantage of WSX-1 knockout mice. Purified naive CD4+ T cells from either WSX-1+/− or WSX-1−/− mice were preactivated with plate-bound anti-CD3ε and then stimulated with IL-27 in the presence of anti-IFN-γ neutralizing Ab. 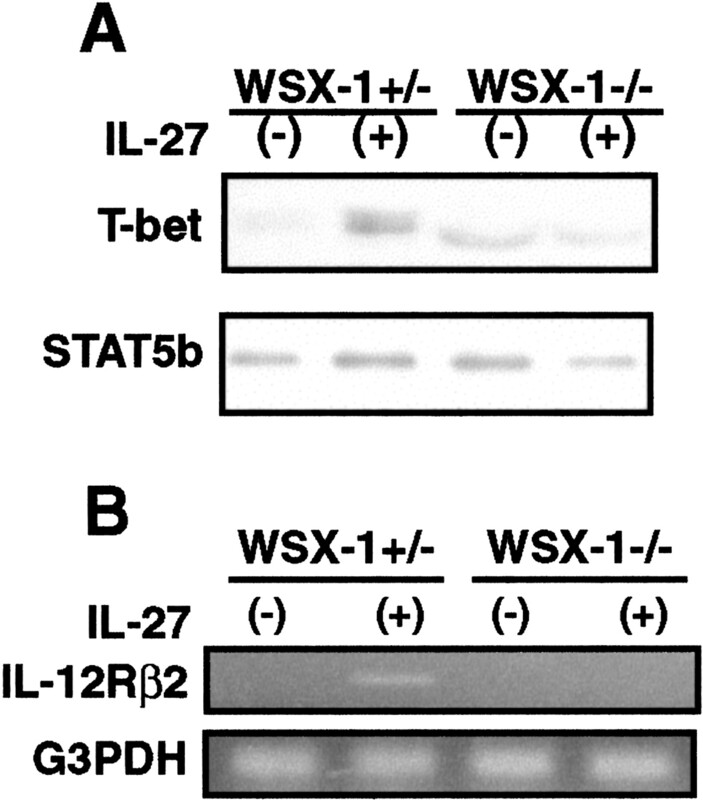 IL-27 markedly stimulated phosphorylation of STAT1 in WSX-1+/− naive CD4+ T cells (Fig. 2⇑B). As expected, in WSX-1−/− naive CD4+ T cells, barely detectable levels of STAT1 were observed after IL-27 stimulation. It is unlikely that STAT1 phosphorylation was induced by IFN-γ produced in response to stimulation, because IL-27-induced STAT1 phosphorylation was observed even in IFN-γ−/− cells (Fig. 2⇑B). These results reiterated that IL-27-mediated WSX-1 signaling involves tyrosine phosphorylation of STAT1. Because both IL-27 and WSX-1 have been implicated in Th1 responses (6, 8, 9), we next examined whether IL-27 induced IFN-γ production in naive CD4+ T cells. Purified naive CD4+ T cells from either WSX-1+/− or WSX-1−/− mice were cultured for 3 days in the presence of APC and Con A with or without IL-27, and the culture supernatants were collected for IFN-γ production (Fig. 3⇓). Whereas IL-12 plus IL-27 stimulation induced IFN-γ production by WSX-1+/− naive CD4+ T cells, the same stimulation did not lead to IFN-γ production by WSX-1−/− CD4+ T cells. IFN-γ production was induced in neither WSX-1+/− nor WSX-1−/− CD4+ T cells stimulated solely with IL-27. Taken together, we consider that IL-27/WSX-1 signaling does not directly induce IFN-γ production, but it provides for responsiveness of naive CD4+ T cells to IL-12 and the consequent IFN-γ production. IL-27 provides for IL-12-mediated IFN-γ production. Sorted CD4+CD45RBhigh naive T cells from WSX-1+/− (left) or WSX-1−/− (right) mice were stimulated with Con A, IL-27, and increasing doses of IL-12 in the presence of irradiated spleen cells for 72 h. Culture supernatants were collected and IFN-γ production determined in triplicate. One representative result of three experiments with similar results is shown. Lines of evidence demonstrate that T-bet is a Th1-specific transcription factor and is critical for Th1 responses (2). Recent studies revealed that T-bet is up-regulated through STAT1 activation (4, 5). In addition, it is also reported that expression of T-bet induces IL-12Rβ2 expression (5). Because WSX-1 signaling involves STAT1 activation and is critical for IL-12-dependent IFN-γ production, we determined whether IL-27 induced T-bet and subsequent IL-12Rβ2 expression in a WSX-1-dependent manner. Purified naive CD4+ T cells from either WSX-1+/− or WSX-1−/− mice were cultured with anti-CD3ε Ab with or without IL-27 in the presence of anti-IFN-γ neutralizing Ab. As expected, expression of T-bet was augmented by IL-27 treatment of the wild-type CD4+ T cells (Fig. 4⇓A). However, the same treatment did not augment T-bet expression more than the basal level in WSX-1-deficient CD4+ T cells. RT-PCR analysis of the similarly treated cells revealed that IL-27 induced IL-12Rβ2 expression in wild-type but not in WSX-1−/− CD4+ T cells (Fig. 4⇓B). These results indicate that IL-27/WSX-1 signaling is important for augmentation of T-bet expression and the following IL-12Rβ2 expression by CD4+ naive T cells. Taken together, IL-27/WSX-1 signaling plays a pivotal role by STAT1-induced T-bet expression at the initial checkpoint of Th1 differentiation. Induction of T-bet expression by IL-27 stimulation. A, CD4+ T cells from WSX-1+/− or WSX-1−/− mice were stimulated with plate-bound anti-CD3ε Ab plus anti-CD28 Ab and anti-IFN-γ neutralizing Ab in the absence or presence of IL-27 for 48 h. Cell lysates were electrophoresed, blotted, and visualized with anti-T-bet Abs. The same filter was stripped and reprobed with anti-STAT5b Ab as internal controls. B, mRNAs were extracted from the cells similarly treated as in A. Same amounts of cDNA, adjusted to the amount of G3PDH measured by quantitative real-time PCR, were amplified for IL-12Rβ2 expression. Experiments were repeated three times with similar results. In this study, we demonstrated that WSX-1 signaling uses JAK1-STAT1 pathway. 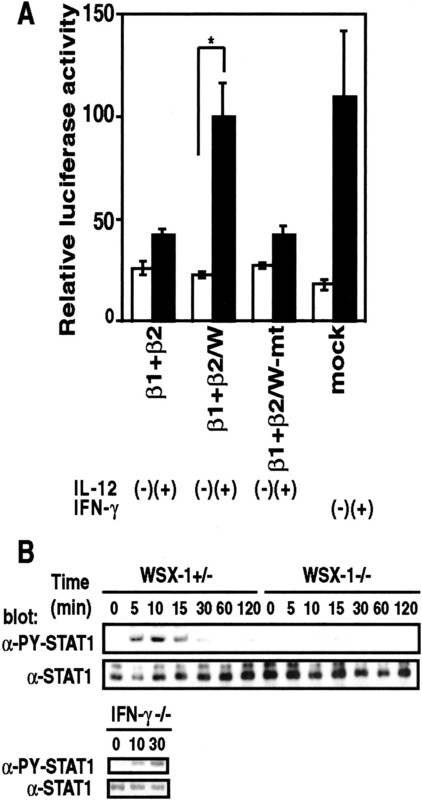 WSX-1 signaling does not directly induce IFN-γ production but supports IL-12-induced IFN-γ production. Furthermore, expression of T-bet was augmented downstream of WSX-1. Taken together, our data suggest that WSX-1 signaling controls the initial step of Th1 commitment by augmented induction of T-bet. Despite the obvious role of T-bet for Th1 induction, its induction mechanism has been controversial. Szabo et al. (2) have suggested that the expression of T-bet is regulated by TCR signaling and STAT4-mediated IL-12R signaling. However, Mullen et al. (3) have reported that T-bet was induced and acted before STAT4 activation in Th1 development. In addition, this study suggested that T-bet expression was STAT4 independent. Furthermore, recent studies elucidated that T-bet was induced by an autocrine pathway involving IFN-γ and STAT1, independently of STAT4 (4, 5). In this study, we show that WSX-1 signaling augmented the expression of T-bet in stimulated naive CD4+ T cells (Fig. 4⇑A). It is thus suggested that WSX-1 signaling plays an important role during the initial step of proper Th1 differentiation by expression of T-bet and the subsequent IL-12Rβ2 expression. However, WSX-1 signaling is not the sine qua non of T-bet expression, because T-bet expression was detected in anti-CD3-stimulated naive T cells before IL-27 stimulation. Moreover, although not augmented by IL-27, we detected a higher level of T-bet expression in anti-CD3-stimulated WSX-1−/− T cells than in wild-type T cells before IL-27 stimulation (Fig. 4⇑A). WSX-1-deficient T cells may have higher sensitivity to antigenic stimulation as previously shown by the higher proliferation of WSX-1−/− T cells in response to stimulation (8). Taken together, without WSX-1 signaling, the expression of T-bet and the following Th1 differentiation is initially impaired but may finally get to the normal level later. In addition to the IL-12 and IL-12R pathway, newly identified cytokines and cytokine receptors have been revealed to play roles in Th1 responses (6, 8, 9, 14, 15). The IL-12/IL-12R system acts via STAT4 activation for IFN-γ production. IL-23 exerts its effects on activated/memory T cells for proliferation and IFN-γ production by STAT4 activation (14, 15). Discovery of IL-27 (9) and our current finding that IL-27/WSX-1 stimulation induces T-bet expression by naive CD4+ T cells through STAT1 activation identify the IL-27/WSX-1 signaling system as a key Th1 commitment step at which naive Th precursor cells commence differentiation into Th1 cells. Thus, various cytokines cooperate at different phases of T cell activation/differentiation to ensure optimal Th1 responses (for review, see Ref. 16). Further clarification of the paradigms of Th1 responses will provide approaches to therapeutic intervention against immunopathologies such as autoimmune diseases and infections. We thank Dr. L. Glimcher for anti-T-bet Abs, and A. Sasaki, T. Yoshida, K. Saeki, and members of the Project W for helpful discussion. ↵1 This study was supported in part by grants from the Ministry of Education, Science, Technology, Sports and Culture of Japan (to H.Y. and A.Y.). ↵3 Abbreviations used in this paper: PY, phosphotyrosine; β2/W, IL-12Rβ2/WSX-1 chimeric receptor; β2/W-mt, β2/W mutant Y824F; JAK, Janus kinase; GAS, IFN-γ activation site. Sprecher, C. A., F. J. Grant, J. W. Baumgartner, S. R. Presnell, S. K. Schrader, T. Yamagiwa, T. E. Whitmore, P. J. O’Hara, D. F. Foster. 1998. Cloning and characterization of a novel class I cytokine receptor. Biochim. Biophys. Acta 246:82. Saito, H., Y. Morita, M. Fujimoto, M. Narazaki, T. Naka, T. Kishimoto. 2000. IFN regulatory factor-1-mediated transcriptional activation of mouse STAT-induced STAT inhibitor-1 gene promoter by IFN-γ. J. Immunol. 164:5833. O’Shea, J. J., M. Gadina, R. D. Schreiber. 2002. Cytokine signaling in 2002: new surprises in the Jak/Stat pathway. Cell 109:(Suppl.):S121. Greenlund, A. C., M. A. Farrar, B. L. Viviano, R. D. Schreiber. 1994. Ligand-induced IFN-γ receptor tyrosine phosphorylation couples the receptor to its signal transduction system (p91). EMBO J. 13:1591. Farrar, M. A., J. D. Campbell, R. D. Schreiber. 1992. Identification of a functionally important sequence in the C terminus of the interferon-γ receptor. Proc. Natl. Acad. Sci. USA 89:11706. Oppmann, B., R. Lesley, B. Blom, J. C. Timans, Y. Xu, B. Hunte, F. Vega, N. Yu, J. Wang, K. Singh, et al 2000. Novel p19 protein engages IL-12p40 to form a cytokine, IL-23, with biological activities similar as well as distinct from IL-12. Immunity 13:715.